Participants will be too busy having fun with foam, music and fog zones to be bored, organizers say. Neon lights illuminate the night sky. Sweaty bodies move fast and weave around each other. Foam, fog and paint are everywhere. A Saturday night at a nightclub? Nope. It’s actually a 5K run. “Think about it as a concert meets a fitness event meets a good time,” says Jose Moreno﻿, organizer of Saturday’s Neon Bubble Dash﻿ and director of Phoenix-based Greater Cause Foundation﻿, the event’s organizer. Moreno says the combination of the lights, bubbles, music and a fun run is the first of its kind in the Old Pueblo. And while you’re running, walking or dancing through the Neon Bubble Dash, there’s no chance to be bored, he says. It all adds up to an athletic event that doesn’t feel like one. At the end of the run, the “Get Bubbly” foam party takes off, featuring DJ JD﻿ from ﻿Phoenix pop radio station Live 101.5, giveaways and neon themed field games. That entertainment isn’t geared just toward the 21-and-over set. “This is really an all-age event,” says Moreno, 29. “We want the family to be here. You are not going to be there and it’s going to be cuss words and just people drunk and drinking. We want to separate those,” Moreno says. Most of the participants at this point are women between ﻿16 to 30, but Moreno encourages all Tucsonans to come play on this course. He adds that they already have a 70-year-old participating, as well as a 7-year-old girl who will hold her birthday party at the event. Moreno, who grew up here and graduated from Amphitheater High School, says that though participants are coming to have a good time, the Neon Bubble Dash’s primary goal is to serve the local community. A portion of the profits will support the Arizona Children’s Association, a child welfare and behavioral health organization with offices in Tucson and Phoenix. This means attending the Neon Bubble Dash is a good deed. But that’s not all, Moreno says. “Come not expecting anything, because we are going just to blow your mind,” he said. Anthony Victor Reyes is a University of Arizona journalism student apprenticing at the Star. When: Runs begin at 7 p.m. Saturday. Register online for specific start time slot. 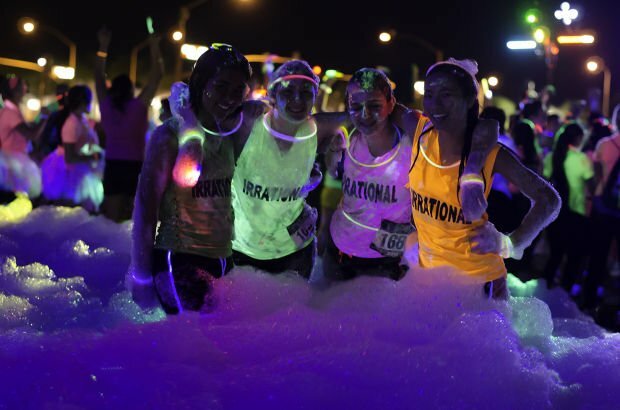 Packet pickup and registration starts at 4:30 p.m.
“Get Bubbly” Foam Party is 7:30-9:30 p.m.
Where: Southwestern International Raceway, 12000 S. Houghton Road. 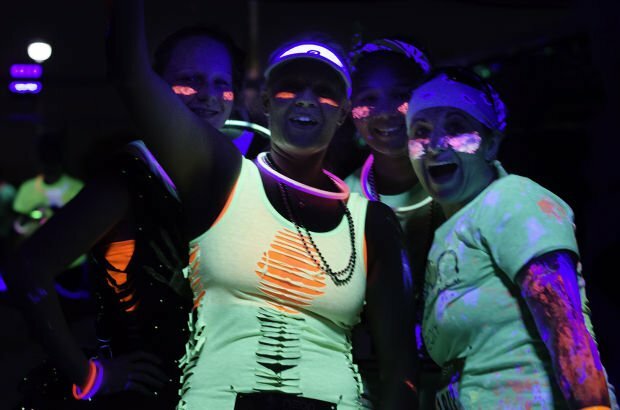 Register: Online at neonbubbledash.com Registered participants will receive a fashion tee, drawstring bag, glow-in-the-dark accessories and access to the “Get Bubbly” Foam Party with their purchase of admission. Participants 21 and older will also receive a 12-ounce beer. Discounts: Coupon number NEON10 will give you $10 off the registration fee.